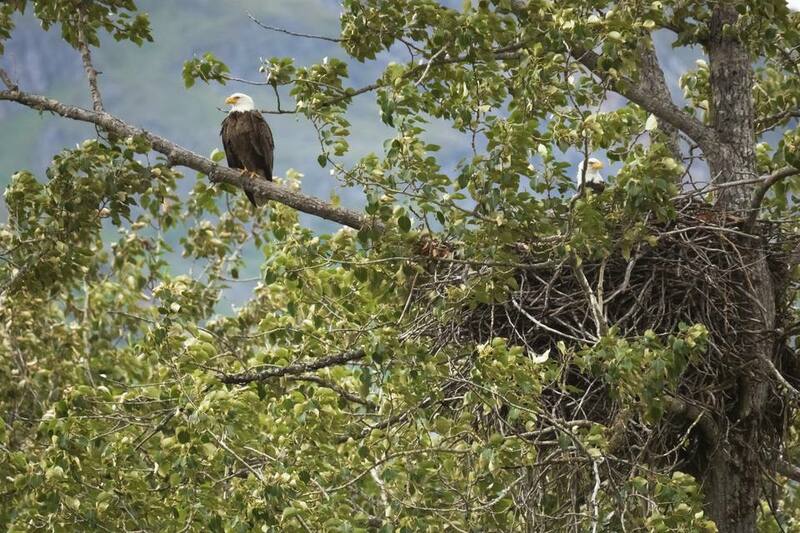 You don't have to go far to see the country's second largest population of bald eagles. Just head north from St. Louis to the Great River Road and make your way to Alton and Grafton, Illinois. Each year, thousands of eagles migrate to the area. They come for the fish found in the cold waters of the Mississippi and Illinois Rivers. The birds begin arriving in late December and stay until March, so there's plenty of time to do a little eagle watching. Below are some of the best places to see the eagles in the St. Louis region. The area around the Brussels Ferry attracts many bald eagles throughout the winter, but riding the ferry is an experience itself that shouldn't be missed. The free ferry is located on the Great River Road, one mile west of Grafton and four miles east of Pere Marquette State Park. It crosses the Illinois River every day (weather permitting). Just drive your car aboard and let the tow boats do their work. The trip across the river only takes a few minutes, but you may have to wait to board during peak times. Conservationists say you'll often see eagles around the Brussels and other ferries because they churn up the water and bring fish to the surface for the eagles to eat. Once you cross the Illinois River on the Brussels Ferry, drive a few miles west to the entrance of the Two Rivers National Wildlife Refuge. This ​8,500-acre refuge is home to bald eagles and other migratory birds, endangered species and migratory fish. The visitors center has a viewing station with long range binoculars, or bring your own binoculars and take a walk along the Gilbert Lake Hiking Trail for prime eagle spotting. The primary function of the Melvin Price Locks and Dam is to keep barges moving on the Mississippi River, but it is also part of the Audubon Society's Great River Birding Trail. It's located south of the Clark Bridge near Alton. When you visit, also check out the National Great Rivers Museum next door. The museum has everything you'd want to know about the Mississippi River and its impact on the St. Louis region. At the museum, you can also sign up for free tours of the locks and dam or attend special eagle events during the winter. Pere Marquette, the largest state park in Illinois, is located just west of Grafton in Jersey County. You can wander through some of the 8,000 acres in search of eagles or join one of the guided tours. The free tours start at 8:30 a.m. at the park's visitors center. Reservations are required. When you're ready to head indoors, stop by the lobby of the Pere Marquette Lodge and warm yourself in front of the giant fireplace. The lodge is also a nice place to stay if you want to turn your day of eagle watching into a weekend visit. The Confluence Tower is south of Alton in the small town of Hartford, Illinois. But its location at the meeting of the Missouri and Mississippi Rivers makes it a good destination for spotting eagles. The tower has platforms at 50, 100 and 150 feet for a sweeping view of the entire river valley. Don't forget to bring your binoculars for the best views. While at the tower, you can also learn about the history of the Lewis & Clark Expedition.